The internal combustion engine relies on the perfect combined balance of air and fuel before ignition takes place. The engine control unit is the central computer which regulates virtually all the systems, components, and sensors of a vehicle. The amount of air which flows into the fuel injection system is detected by the mass air flow sensor. It transmits this information about the air back to the engine control unit. Based on the analysis, the engine control unit will cause the fuel injectors to inject just the right amount of fuel into the internal combustion chamber. That way, the air and fuel mixture will be just right, resulting in a properly performing engine. The mass air flow sensor may seem like a small insignificant component, but it really has a huge effect on the engine’s performance. If this sensor cannot detect the air flow properly, then it won’t transmit the right information to the engine control unit. This will cause a variety of unpleasant symptoms which will impact your driving ability and experience. Once you notice any of these symptoms, you should do something about them quickly. Take your vehicle to the nearest mechanic and have them check your mass air flow sensor. If it is determined to be the problem, have it replaced immediately. Below are the top 5 symptoms of a bad mass air flow sensor in your car. 1) Acceleration Issues – The gasoline flow to the engine must be consistent and steady. This is how acceleration is possible whenever you step on the gas pedal. But if you have a bad mass air flow sensor, then stepping on the gas pedal won’t cause immediate acceleration. Since there will be an imbalance of air and fuel in the combustion chamber, there won’t be enough gasoline to accelerate right away. You’ll need to replace the mass air flow sensor first and then it should be okay. 2) Lean Engine Idling – An engine idling problem means you have a lack of fuel and an abundance of air in your internal combustion chamber. This will cause very little gasoline to get ignited in the chamber. The reason for this happening can often be attributed to a bad mass air flow control sensor. Your engine’s performance will ultimately suffer until this problem is resolved. Replacing the sensor is the only way to do this. 3) Engine Stalling – If your engine stalls after it has been running for a few minutes, then it could be a sign that your mass air flow sensor is bad. In the beginning, your engine control unit may receive the proper air flow information from the sensor. But, after a few minutes, the information will be inaccurate. This will cause the engine control unit to inject the wrong amount of fuel into the combustion chamber. 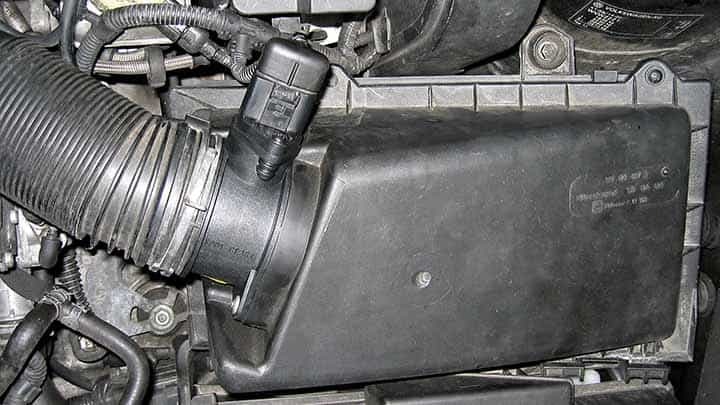 4) Difficulty Starting Engine – Once your mass air flow sensor has gotten in real bad shape, it may cause you problems with starting your engine altogether. Remember that the engine needs the proper air and fuel mixture immediately before it can start up. If your mass air flow sensor is bad, then your engine likely won’t turn over until you replace the sensor with a new one. 5) Jerkiness – One of the more extreme symptoms of a bad mass air flow sensor is jerkiness as you attempt to accelerate by stepping on the gas pedal. Not only will the engine hesitate, but there will be irregular jerkiness throughout the entire cabin of the vehicle. This will make it uncomfortable for both you as the driver and any passengers that you may have in there with you.